The carnage lasts all of two minutes. Alexandre Bissonnette, a suspect in a shooting at a Quebec City mosque, arrives at the court house in Quebec City on Feb. 21, 2017. QUEBEC — Footage captured by surveillance cameras during the 2017 shooting at a Quebec City mosque shows Alexandre Bissonnette calmly murdering men lying on the carpet who were already injured by his bullets. Bissonnette hides several times behind a column in the prayer room to recharge his weapon before returning to empty his gun into the bodies of worshippers. The Crown prosecutor presented the footage on Wednesday to Superior Court Justice Francois Huot as evidence during sentencing arguments for the gunman. 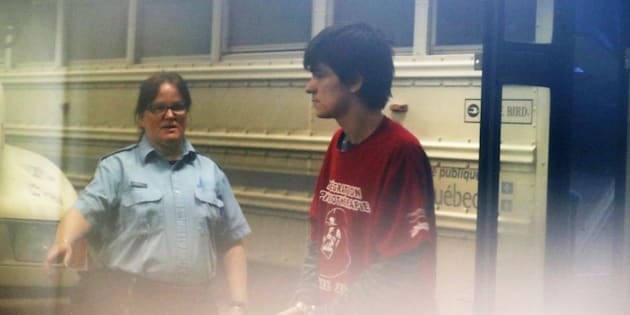 Bissonnette, 28, pleaded guilty in March to six charges of first-degree murder and six of attempted murder in the mosque shooting. Earlier in the day, Huot refused the request made by various media outlets to release the recordings to the public. Releasing the videos, Huot said, would undermine the administration of justice and is not in the public interest. "The public doesn't need to see the images to understand the scale of the crimes committed," he told a Quebec City courtroom. Huot did allow media, however, to describe the content of the videos. Prosecutor Thomas Jacques told the court several times how Bissonnette acted "methodically and strategically" throughout the entire shooting. Several members of Quebec City's Muslim community remained in the room to see the footage, while others preferred to leave. Mosque president Boufeldja Benabdallah said he was relieved by Huot's decision not to release the recordings. "There is something in a description but...the impact of an image is engraved in the memory," he said, adding he would leave the courtroom if the footage was played. "A story, you read it and you forget about it." A woman whose husband was killed in the attack on Jan. 29, 2017, also praised the decision, calling it a "good start" that would ensure her children would not see the images from the tragedy. The Crown argued that releasing the video could traumatize victims of the attack or incite other people to commit violence. The lawyer representing the media consortium, which included The Canadian Press, said his clients were merely seeking to fulfil their role as providers of information and that they would not have shown any "raw violence." Bissonnette can face consecutive sentences, which could mean up to 150 years in prison, but his lawyers argue he should be eligible for parole in 25 years. They say 150 years in prison is equivalent to sentencing Bissonnette to death by incarceration. Bissonnette killed six worshippers: Mamadou Tanou Barry, 42; Abdelkrim Hassane, 41; Khaled Belkacemi, 60; Aboubaker Thabti, 44; Azzeddine Soufiane, 57; and Ibrahima Barry, 39. The counts of attempted murder involved five people who were struck by bullets and a sixth charge encompassing the other people present at the mosque.